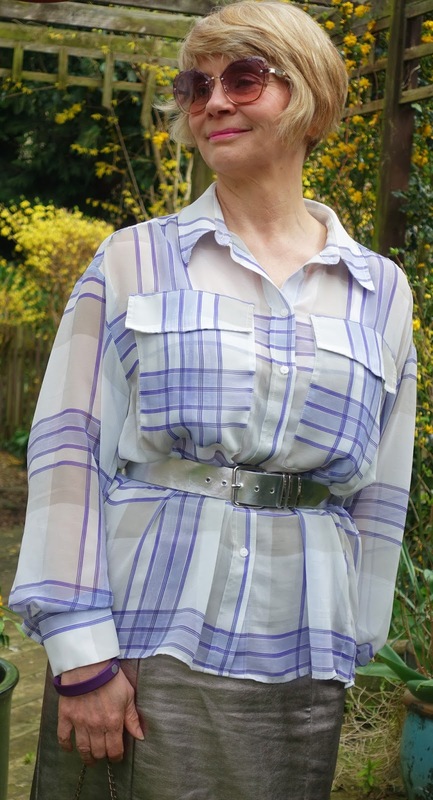 White and lilac blouse three ways | Is This Mutton? 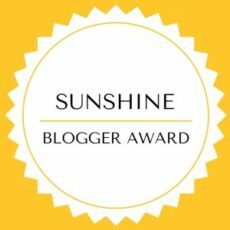 My blogger friend Jacqui from Mummabstylish and I both have the same blouse - a complete coincidence, but when we realised, we thought it would be a great idea to style it a few different ways. 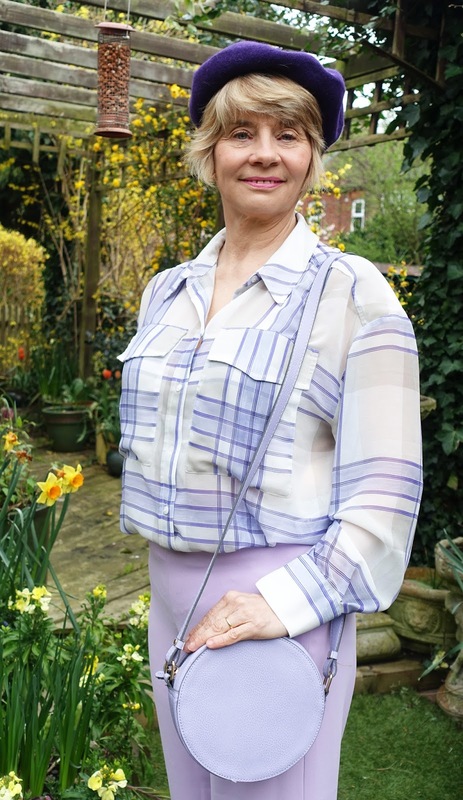 The blouse itself is from Marks and Spencer and has a pale lilac stripe. I've been wearing it in winter under a purple cashmere jumper but I've tried three different looks here. The first is a playful look ideal for going out with friends, or shopping (see the flat shoes?). The lilac cropped trousers with a delightful fringe are from River Island. Team this with a circle bag - very "in" - and this one, in lilac, is from Acccessorize - and finally a purple beret. I bought mine on eBay for less than a tenner. The shoes are rose gold delights, old, from Boden. Next up: we have Melania Trump to thank for this look. Pencil skirts are de rigeur this spring, and they can be worn with voluminous belted tops. My silver pleather skirt from Next is a bit too big and so it was a better look than tucking the blouse in. This is a more dressy outfit, ideal for a date night dinner. I added silver shoes, a silver belt, silver lurex tights, a purple evening bag and hexagonal lilac sunglasses from River Island. Finally, a look for the office. Metallic is the key here. I'm wearing straight legged navy trousers, several years old, from Marks and Spencer, and a peplum jacket from Phase Eight (now reduced in price). To add some interest, I have metallic brogue shoes and lurex socks from Sainsbury's, and an embellished circle bag from Accessorize. 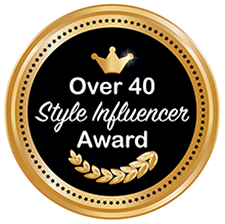 Up-to-the-minute bags and sunglasses can instantly update an outfit, and you can buy these relatively inexpensively from retailers like Acccessorize, River Island, Asos. Don't assume that these stores won't have anything for older women. I find they have lots of desirable items, and if you order online, you don't even have the trauma of rubbing shoulders with teenagers. Now let's see how Jacqui got on. Jacqui is wearing her M&S blouse with M&S cropped jeans that she DIY'd frayed herself; M&S navy court shoes, grey jumper from F & F, and silver Zara bag. 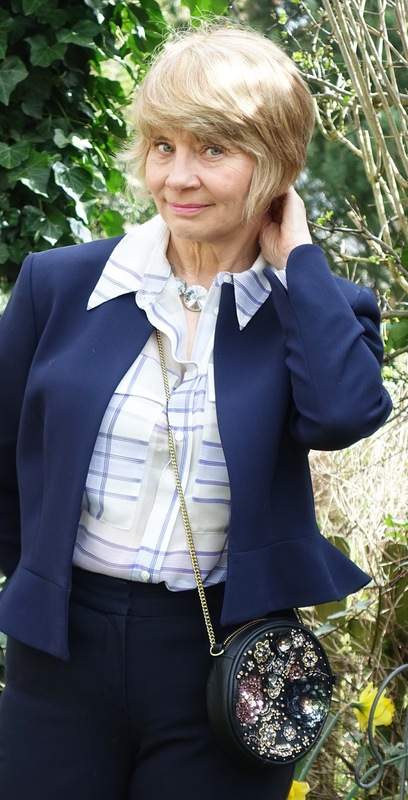 Don't forget to visit her blog, Mummabstylish, to see the other outfits Jacqui has created with the blouse. Sharing this post with: Fake It Until You Make It at Fake Fabulous, #IwillwearwhatIlike at Not Dressed as Lamb, Visible Monday at Not Dead Yet Style; Creative Mondays at Claire Justine, Style with a Smile at Stylesplash; Turning Heads Tuesday at Elegantly Dressed and Stylish, Chic&Stylish at Mummabstylish, Top of the World Style at High Latitude Style, Fancy Friday at Nancy's Fashion Style and Fabulous Friday at A Pocketful of Polka Dots. I really love all of the outfits, particulary the first with all of the purple and lilac shades. Loving your circle bag.. ive been a bit obsessed over them lately. The top is soft and lovely and youve paired it wonderfully with blues and mettalics. love those pointed heeled shoes as well! I love all three outfits Gail, especially the first one. 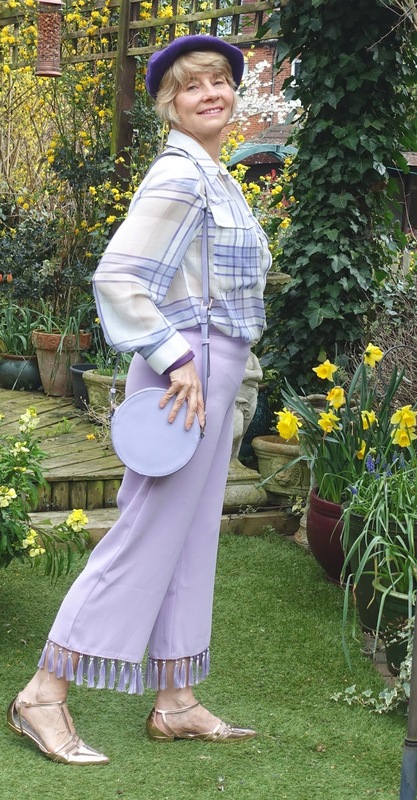 The purple beret and round bag are fab! Thanks for linking up! Love those tassel trousers Gail. I'm going to check them out, I hope the length will be ok on me. Lots of stylish looks here, I also like it paired with the Navy.